-Read the excerpt below from Scott Whitlock's post at Media Research on Jan. 22. New England Patriots QB Tom Brady. The three major networks, through Thursday morning (Jan. 22), devoted 67 minutes and 49 seconds to obsessing over every aspect of whether the New England Patriots cheated in their AFC championship win on Sunday (Jan. 18). Yet, only ABC allowed a scant 34 seconds to the Obama administration’s release of five terrorists out of Guantanamo Bay and back to areas connected with extremist violence. The contrast is 120-to-1. NBC was, by far, the most lopsided in terms of journalistic priorities. 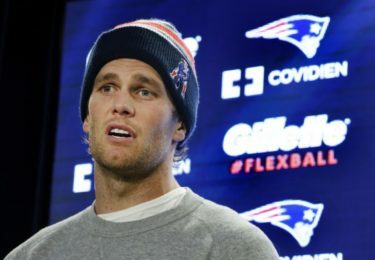 From Monday through early Thursday, the network’s morning and evening shows produced 33 minutes and 35 seconds to the so-called “Deflategate.” Last week, however, NBC didn’t offer any coverage to the release of five detainees, just seven days after the slaughter of cartoonists in Paris. She ominously noted, “Many of the prisoners were transferred to Oman which shares a border with Yemen, a hotbed of al Qaeda activity.” That 16 second story was followed up with an 18 second report on Thursday’s World News. Not only did the release of the detainees get almost no coverage, the contrasting football story featured hyperbolic language. While the networks have been flooding America with coverage of deflated footballs, they have been quietly covering for the President’s unpopular attempts to close Guantanamo Bay. 1. What type of bias do the “Big Three” networks display in their news coverage on these stories? 2. Do you think producers at CBS, NBC and ABC purposely underreported the release of the Gitmo terrorists? Explain your answer. Something to consider: The Defense Department announced on Jan. 14: Al Khadr Abdallah Muhammad Al Yafi, Fadel Hussein Saleh Hentif, Abd Al-Rahman Abdullah Au Shabati and Mohammed Ahmed Salam were handed over to Oman and Akhmed Abdul Qadir was transferred to Estonia. Try to find photos of these men. The media should be curious as to who they are, what they look like, why they were held at Gitmo for so long (how long?) and what they did. — If the men are innocent, isn’t it the media’s job to tell us about it?